We admit that it is unfortunately awkward for fully grown adults to carry around a sack of candy, even during Halloween. If you do, chances are good people will just assume you’ve been stealing from children. Fortunately there adult-friendly ways to consume as much sugar as the kids wandering the neighborhood dressed as Pizza Rat. Here, five mature ways to eat (and drink) your Halloween candy. If you aren’t one of candy corn’s staunch advocates, you can make the most of it by sneaking it into an alcoholic beverage. Sam Hernandez, head bartender at New York’s DBGB, blends spicy Becherovka, Amaro Montenegro, whiskey and a candy corn syrup. Whether you want the chewy garnish on top is up to you. Dana’s Bakery in New York’s Gansevoort Market took the inspiration for its October macarons straight from a plastic Halloween pumpkin basket. 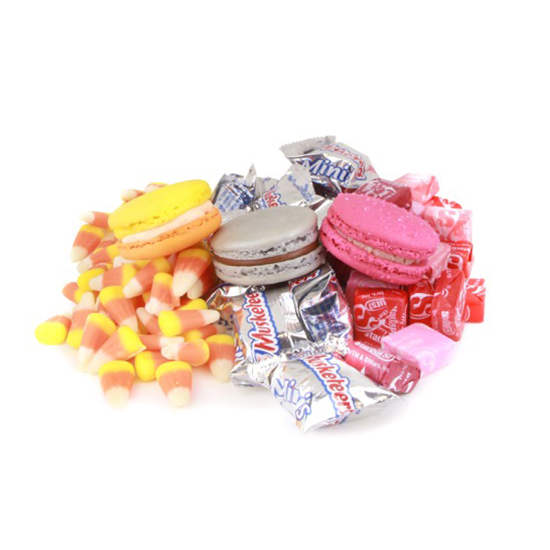 Starburst, Three Musketeers and candy corn flavors are available online and in stores through Halloween. Mounds bars are not the most popular mini candy bars out there for trick or treaters. But put them in the center of these cookies and we promise no one will complain. OK, cotton candy is not a traditional Halloween sweet; it makes the list because it is just as inappropriate to be seen with as an adult. No one will take you seriously if you’re carrying around a ball of spun sugar the size of your head. They will if you order this riff on a classic cocktail, though. At Piora in New York, Shinya Yamao pours his old fashioneds over housemade cotton candy, making it melt into the glass. The process makes good theater if you want to impress a date. At the Summer House Santa Monica in Chicago, Erin Mooney combines two childhood favorites to make one grown-up-worthy dessert. It’s Halloween meets your post–soccer game snack.